Why did Mosley want to quit against Pacquiao? By John F. McKenna (McJack): When Shane Mosley (46-7-1-1, 39 KO’s) fought Manny Pacquiao (53-3-2, 38 KO’s) on May 7 everyone knew that his skills were diminished and that his career was on the downward slope. Everyone expected him however, to make a go of it and attempt to win the fight. After Mosley was knocked down in the 3rd run the fight seemed to go out of him. He had the look of utter surprise and yes, a look of fear came over his face. He could hot believe that, despite all that had been written by boxing writers and the accounts of what other fighters said about Pacquiao, that he was that fast and hit that hard. He fell into the trap almost all of the “Pacman’s” larger opponents have. How does a guy of that size generate so much speed and power? The story that has been circulating in the media is that Shane Mosley had a blister on his foot that made it difficult for him to move, block Pacquiao’s punches and counter with his own shots. Somehow the blister story does not ring true. One must remember that “Sugar” Shane Mosley defeated Oscar De La hoya twice and has KO victories over Fernando Vargas, Ricardo Mayorga and Antonio Margarito. What was it that made this once proud warrior want to quit, and go out with a wimper? That is the effect that Manny Pacquiao has on his opponents. Mosley saw what Manny did to Hatton, Clottey, De La hoya, Margarito and so many others. He did not want to go out that way, but he did not want it to be his fault that the fight was stopped. 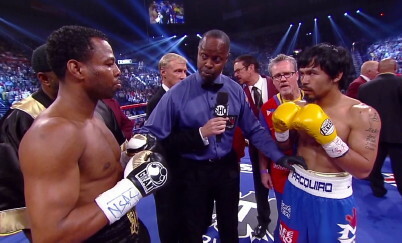 Boxing » Manny Pacquiao » Why did Mosley want to quit against Pacquiao?